Yaaaaay Okonomiyaki!!! Remember that friend who gave me that awesome Kyocera ceramic santoku knife? He also introduced me to Okonomiyaki. Then I became obsessed with it on a subsequent trip to Japan, but I never thought to make it at home. I don’t even know how I made the leap between Okonomiyaki and an over-supply of cabbage. btdubs, I can't find my camera, so forgive the impersonal photos. I'll fix this post when my camera comes out of hiding. Ok, the basics. 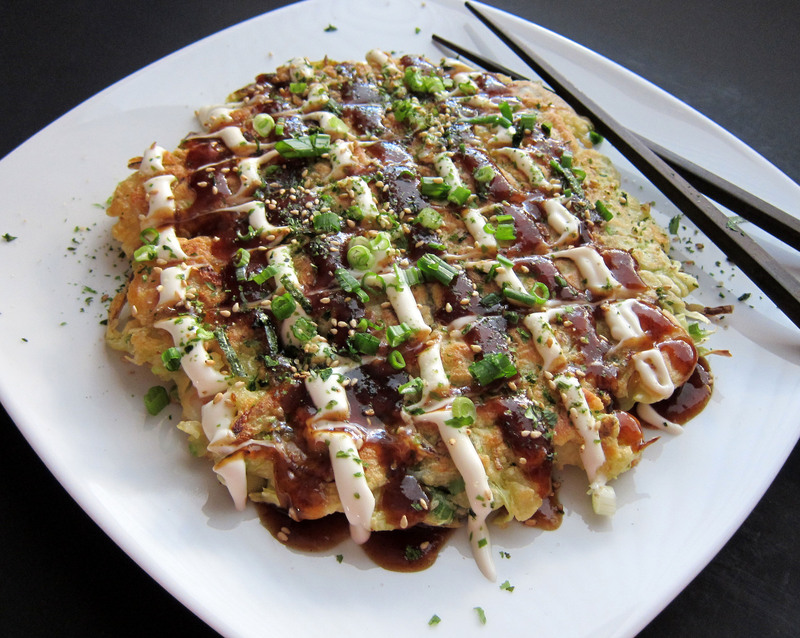 Okonomiyaki is like a big, savory Japanese pancake with lots of fun toppings like katsu sauce and dried bonito flakes. The batter is just flour, baking powder, a little dashi or veg broth. The bulk of the pancake is shredded cabbage and two eggs. The remaining contents of the pancake are totally flexible – you can add any meat, bacon, shrimp, squid, fish, veggies, whatevs. I added diced shrimp, bean sprouts, and enoki mushrooms. 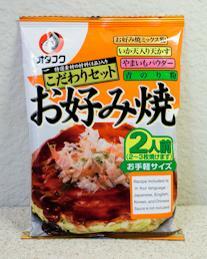 Okonomiyaki kit...complete with hilarious translated instructions and adorable Japanese cartoons. The perk of the kit is that it contains the special yam powder. That yam is hard to find. It’s also kinda gross and viscous. Sooooo let’s go with the powder. So you make the batter and throw the rest of the ingredients into a big bowl. Give it a few good turns but don’t mix too hard. Then take a scoop, put it on a griddle or frying pan, and smack it down into pancake-shape using a spatula. When it’s done, eat it with BEER!!! Katsu makes everything better. Or maybe just fried things. I wouldn't like put it on ice cream.